This new painting by Michael Short shows E.A.W. 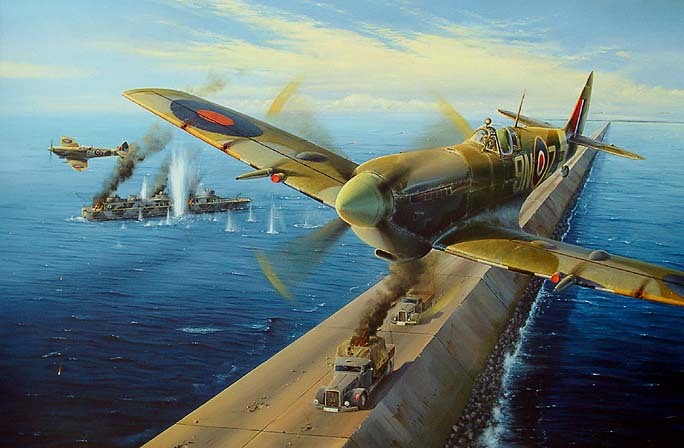 (Ted) Smith (author of 'Spitfire Diary', who flew Meteors with 74 Squadron) flying a Mk XVI Spitfire of 127 Squadron, attacking a flak barge, and hitting a German vehicle, on the Zuider Causeway in Holland on 16 Apr 1945. His No 2, Alan Willis, got the barge which was firing at Ted. This British Military History site owned by Doug Tidy. Want to Join the British Military History ring? 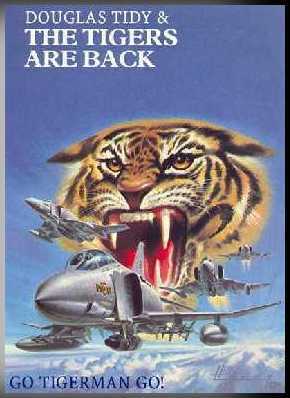 The Tiger Squadron Webring made possible by the Webring. No 74 Squadron Royal Air Force has an unbroken link with South Africans over the past 80 years. Lieutenants Kiddie, Savage, Howe, Clarke, and Van Ryneveld served with the Squadron in 1918, and Van Ryneveld's brother (later Sir Pierre Van Ryneveld) was commander of XI wing in which the Squadron served. 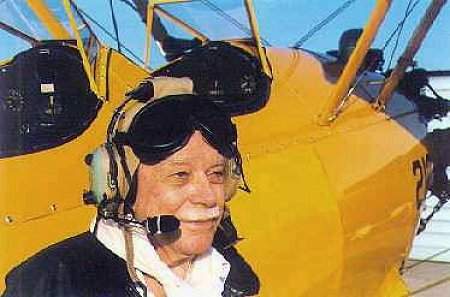 In WW2 South African 'Sailor' Malan commanded the Squadron, and Bob Human, 'Tookie' Tooke, and Harries followed. Once again there was a Commanding Officer who was a South African when John Howe took over the Lightnings in 1954. Jacques Kleynhans, 'Lofty' Lance, and Rich Rhodes followed. Examples of the 3 types of aircraft flown in WW1 and WW2 are in the Museum of Military History at Zoo Lake in Johannesburg together with other artifacts, including the instrument panel of a German Heinkel aircraft shot down by 'Sailor' and his medals and decorations. 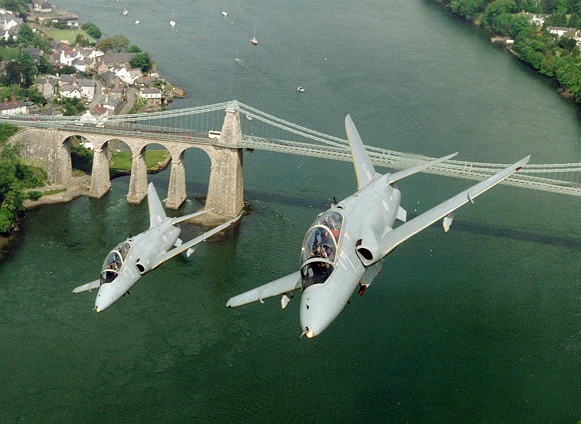 Today the Squadron is responsible for fast-jet pilot training at RAF Valley, on the Isle of Anglesey. off North Wales. Doug Tidy served both in 74 Squadron and in the South African Air Force so has a great interest in both. who has kindly given us permission to reproduce it in it's entirety. Not for the first time, but quite probably the last, on 22 September 2000 74(F) Squadron officially disbanded. Victim of 'rationalisation' in the RAF, three reserve squadrons at Valley was deemed too inefficient, so one had to go, 74 drawing the short straw. In a low-key ceremony outside its hangar at a windswept Valley, the standard was paraded for a final time in front of Air Vice Marshal Robinson, who broke the news that 74 definitely wouldn't be re-appearing as a Eurofighter squadron in the foreseeable future. Speculation had thought that it would, possibly as the Operating Conversion Unit, but it seems a decision has been made and 74 doesn't feature in the RAF of the future. Formed at Northolt on 1 July 1917, the squadron saw action in France the following year with SE5as. 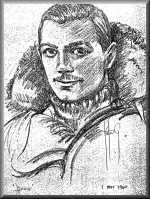 One of the first flight commanders was Captain Mick Mannock, by then already a legendary fighter ace. Thirty-six victories were claimed by Mannock in the first three months of his command, and by July he had recorded a total of fifty-eight, one more than contemporary James McCudden of 56 Squadron. Following this success Mannock was promoted to Major and given command of 85 Squadron. Also with 74 at this time was Ira Jones, who went on to claim thirty-seven victories by the end of the war. Disbandment for the first time followed in July 1919 on return to the UK, and it was to be sixteen years before the unit would re-form, the expansion period of the middle thirties requiring many squadrons to re-appear. It was an unusual place to do it, being the transport ship 'Neuralia' which was en route to Malta in response to the crisis in Abyssinia. Initially known as 'Demon Flight', the squadron of Hawker Demons was officially christened 74 Squadron on 14 November 1935. A return to the UK the following year brought a change of mount to Gauntlets in 1937, based at Hornchurch in Essex, where they later converted to Spitfires just prior to the outbreak of the Second World War. Defensive patrols were made during the early war months and cover provided for the evacuation of troops from Dunkirk. During this time the unfortunate 'Battle of Barking Creek' occurred, described elsewhere on this site in an article on 56 Squadron. The Battle of Britain brought extensive action; based at Hornchurch and its satellite station at Rochford (now Southend Airport), the squadron was in the thick of the battle, protecting the skies over east London. One of the celebrated pilots of the battle, Flt Lt 'Sailor' Malan DFC flew with the squadron and during July tangled with the German air ace Werner Molders - 74's Spitfires chased the Me109s and claimed three destroyed. Malan, a South African by birth, was a born leader of men and had claimed twenty victories by the end of 1940. Awarded the DSO, DFC and bar, he added another twelve victories before retiring from operational flying a couple of years later. Ending the war as Group Captain, he returned to South Africa as a farmer, sadly succumbing to Parkinson's Disease in 1963. Later in the Battle, the squadron was withdrawn temporarily to regroup, returning in the latter stages with a move to Coltishall in September. This meant participation in Douglas Bader's 'Big Wing', the unit claiming six enemy aircraft downed on the 11th. 1941 would see action staged from Acklington, Llanbedr & Long Kesh, flying defensive patrols. Much of the squadron's life was based overseas and this trend was continued with deployment to the Middle East in 1942, operating from Egypt with Hurricanes. For a brief spell in July and August 74 Was without any aircraft, the ground crews helping with the maintenance of Liberator bombers at Ramat David in Palestine. Conversion back to Spitfires happened in September 1943 while in Cyprus and the squadron remained in theatre until April 1944 when it returned to North Weald to prepare for Operation Overlord. Fighter sweeps followed the D-Day landings, supporting the Army as it swept across France towards Berlin, finally ending with the push through Germany in April 1945. Ironically one of the few squadrons to escape disbandment after the war, 74 converted to the Meteor F3 in 1945 at Colerne, forming the first all-jet fighter wing in the RAF with 504 Squadron. A move back to Norfolk in August 1946 provided a new home at Horsham St Faith, now Norwich Airport. Meteor 8s followed in 1951, the squadron providing one half of the day fighter establishment with 245 Squadron, 23 Squadron being the dedicated night fighter unit with the venerable Mosquito NF36. March 1957 brought an upgrade to the Hunter F4, short-lived as F6s followed six months later. A move back to Coltishall occurred in 1960, Horsham being disposed of by the RAF due to the rapid encroachment of the city around it. As soon as the squadron reached Coltishall, re-equipment with the Lightning signified entry to the Mach Two club for the RAF. The first squadron to fly the finest jet in the world, deliveries commenced on 29 June with F1 XM165/A in the capable hands of test pilot Jimmy Dell. There were no two-seat trainers for the initial pilots, so all training was conducted in staid Hunter T7s; if the two types were required to fly in formation, the Lightning had to give the Hunter a 28,000 ft head-start! 74 provided a four-ship routine for the 1960 Farnborough Airshow and became almost a national institution, the fantastic performance of the aircraft promoting the idea in the public that the pilots were 'Supermen'! Nine aircraft replaced the four-ship routine in 1961 and the following year the squadron provided the official display team, rather unoriginally known as the 'Tigers'. 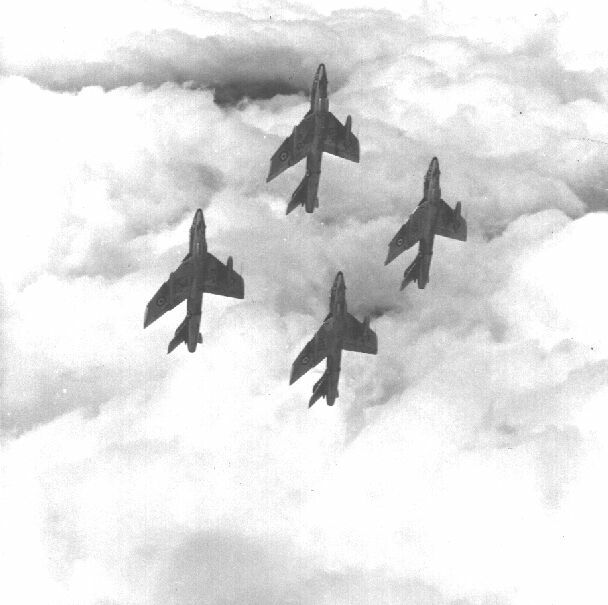 Scotland beckoned with a move north to Leuchars in February 1964, F3s equipping the squadron in the April. XP700 was the first to arrive, but tragedy struck on 28 August when Flt Lt Owen was killed while practising for the annual Battle of Britain Day airshow. This overshadowed 74's stay at Leuchars which lasted three years, when after converting to the longer range F6 it moved to Tengah, Singapore as part of the Far East Air Force under the banner of 'Exercise Hydraulic'. Seventeen (!) Victor tankers were required for the journey across Cyprus and the Persian Gulf, but even so the unit's T5 had to be left behind as it would have put an unacceptable burden on the tankers. Another, XV329, was taken out by ship! As the only air defence squadron in the Far East, 74 were kept very busy with practice scrambles and exercises with other military units. Detachments to Australia were common, again involving support from the Marham Victors, but in 1971 the British Forces in the Far East were withdrawn and 74 was disbanded for the second time on 1 September, its Lightnings re-equipping 56 Squadron at Akrotiri. The Falklands campaign of 1982 was to be instrumental in the re-birth of 74 Squadron, as immediately after the conflict with the creation of RAF Mount Pleasant there was a need for a full-time fighter squadron to mount air defence. 23 Squadron from Wattisham was tasked this duty, but this left a big gap in the defence of southern England so it was decided to re-form a squadron at the Suffolk base. Some ex-US Navy F4J Phantoms were purchased for �33m as these were the closest equivalent to the F4K/M British-built versions currently in RAF service, and 74 Squadron was chosen as the unit to be re-born. The first three aircraft arrived at Wattisham on 30 August 1984 after a transatlantic crossing from Goose Bay. Aircrew had worked up on the type at El Toro and Yuma air bases in the States so it was immediately pressed into action, defending the southern skies alongside old sparring partners 56 Squadron. Easy to spot because of the smoke trails left by the J79 engines, the 'J became a favourite mount for the Phantom jockeys, having a superior turn of speed at altitude compared to the Spey engined FGR2. To illustrate this, October 1987 saw the squadron celebrate its 70th anniversary by making a record-breaking run from London to Edinburgh in 27 minutes, somewhat faster than British Rail could manage! 74 Squadron were to spend a relatively short time at Wattisham in modern-day terms, their spell lasting a mere eight years from 1984 to '92. However, in that brief time the spirit of the 'Tigers' was well and truly embedded in the spotting fraternity, partly due to the squadron being based in the western HAS complex which meant that they had to taxi past Crash Gate 2, where they were seemingly only an arms length away. It was unusual to be able to get so close to operational aircraft that to almost feel them as they went past, taking in the full aroma of the jet efflux, was almost as good as being in the cockpit. You felt part of the action, as if they needed your permission before venturing onto runway two-three. Names on cockpits became familiar, more so than the pilots of 56, who stayed well away on the eastern side of the airfield. Rundown of the Phantom fleet in the early nineties provided a surplus of FGR2 airframes, so to standardise the fleet the 'Js were retired at the start of 1991 in favour of the Spey powered variant. Retirement for the Phantom followed in October 1992, 74 Squadron being the last to operate the type, also having one of the shortest operating careers at eight years. The Tiger trademark of 74 Squadron was transferred to the tails of Hawk T1s, flying as part of 4 FTS out of RAF Valley, Anglesey. Now classified as a reserve squadron, it joined 19(R) and 208(R) Squadrons in training the fast jet pilots of the future. Again it was to last eight years, but the beancounters decided only two reserve squadrons are needed, so the proud history of 74 has been laid to rest. "Tiger! Tiger! Tiger! What noise do tigers make?" "How do we feel about joining 19 Squadron?" All heads hung low. Some may say "It's just a number". But, it's tradition, history, pride and aspiration. It seems astonishing that the RAF will not have its founding member present at future Tiger Meets, for they are and have been a cornerstone of NATO co-operation over the last forty years ago. Time has come to review squadron allocations in the modern-day RAF; maybe it should adopt the French system of smaller squadrons under the administration umbrella of a wing. For if the air force cannot value its past, it will disappear into the ether of a multi-force command. As usual, the beancounters know the cost of everything, but the value of nothing. The collage on the right is a composition of the Doug Tidy years.